ESP continues to develop its Duceri range of Emergency Lighting, and the latest addition is a new range of Self Test Emergency Light Fittings that offer numerous benefits over standard fittings by reducing the costs and time associated with manual testing and inspection. Emergency lighting installations must have routine tests carried out, and these tests should all be documented with the results held on file. Whilst installing standard emergency light fittings is straightforward enough, the task of regularly inspecting every fitting on site for functionality, operation and duration can be an expensive, labour-intensive exercise. By opting for self test fittings, installers and contractors can save valuable time and expense, with each self test fitting utilising an inbuilt processor to initiate ‘Self Tests’. Once an issue is discovered, the fitting will clearly display the fault via the status LED. During initial power up, an automatic commissioning stage will begin, and after the initial charge up time (up to 72 hours), the unit will carry out a full duration test. After all initial tests are completed successfully, the inbuilt processor will start the standard programmed test schedule, reporting failing functions via the status LED. 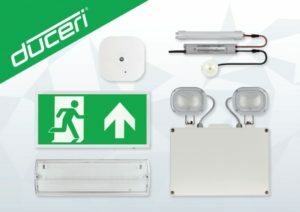 In addition it is also possible to initiate a manual test on self test emergency lighting fittings for extra peace of mind ESP has added five new self test products to its growing Duceri Emergency Lighting range. ● 3W LED Maintained Emergency Self-contained Downlight with Self Test and Interchangeable Open and Corridor Lens. The new Self Test range of products has been tested, and complies with, the latest standards. They are easy to install – without any need for key switches or data cables – and offer convenience and reduced maintenance time and costs. For further information contact ESP on 01527 515150, or email info@espuk.com or visit espuk.com.